Worn to symbolise your love, passion and the promise of commitment, an engagement ring is the most meaningful gift a man will ever give, and a woman will receive. A physical reminder of the promise of a lifelong commitment, a diamond engagement ring conveys unquestionable loyalty and uncompromising love. Worn on the fourth finger on the left hand against a specific vein that runs to the heart, it is forever a reminder of an indescribable love, and a life shared. The most powerful expression of love, an engagement ring is an essential part of the marriage proposal. The history of diamond engagement rings date back to 1477 when the Archduke Maximilian of Germany proposed to his wife-to-be, Mary of Burgundy, with a diamond ring symbolising his betrothal. The ring consisted of numerous small diamonds that were set in the shape of the letter “M,” her initial. At the time, diamonds were extremely rare and costly, and only the richest and noblest of families could afford them. Mary of Burgundy’s ring is believed to have been the first ring that contained faceted diamonds, and marked the beginning of the engagement ring tradition. During the Renaissance, engagement ring designs became elaborately decorated and eventually evolved into the “faith ring,” in which two hands, holding a diamond, represented the unity of love. Today, diamond engagement rings come in numerous shapes, sizes and designs, and there is no limit to the possibilities of what can be created. The diamond ring continues to be the most powerful statement and expression of love, and has become an essential part of the marriage proposal. The true value of an engagement ring is intangible, just like your love, passion and commitment. It is unlike any other piece of jewellery given or received: a diamond engagement ring will not only capture and preserve your special moment, but it will last well beyond your lifetime, to be enjoyed for generations to come. Diamonds consist of pure carbon, and are the strongest material known to man. The word “diamond” comes from the Greek word “Adamas,” meaning “unconquerable.” Just like your love cannot be conquered, a diamond cannot be broken, making it virtually indestructible, and its lifespan, infinite. Only a diamond can cut another diamond, and its strength and longevity makes it the most enduring option for an engagement ring. Diamonds are among the oldest of the Earth’s riches, as they were formed over 3 billion years ago. The most antiquated object one can own, a diamond is an exceptional treasure that can be passed down for generations to come. Nothing says “forever” quite like a diamond: just like your love and devotion, it will stand the test of time, symbolising your unbreakable bond, forever. Just like finding the perfect woman, finding the perfect diamond engagement ring to express your love is a thrilling experience. Shimansky creates some of the most beautiful diamond engagement rings in South Africa, in a variety of designs and settings. A Shimansky designer engagement ring, from its conception and design, to its final destination, is inspired by the special moment upon which it will be presented as a gift of true commitment. It captures and preserves the memory of your special moment, so that it can be re-lived over and over again. An engagement is one of the major milestones in a person’s life, and we understand the importance of finding the perfect ring that expresses your love, reflects your personality, and mirrors your relationship. Finding the ring that speaks to your heart is an emotionally-rewarding journey that we are delighted to embark on with you. Just like no two relationships are the same, no two diamonds are the same, making your engagement ring a one-of-a-kind jewellery creation. Only the finest hand-selected diamonds are used in all Shimansky jewellery creations, and the entire creation process, from the design, to the sourcing of rough diamonds and their cutting and polishing is completed in-house. Our signature diamond cuts and engagement ring designs are protected by international copyright laws, and require an expert level of skill, the latest technology and years of experience to be mastered, making them as special and unique as you are. Shimansky diamond engagement rings come in a variety of styles and designs; from classic solitaire diamond rings, to elegant three-stone trilogy rings, to completely unique engagement ring designs. A Shimansky signature design, the Millennium Diamond Engagement Ring, is a true South African icon and one of the most coveted engagement rings in the country. Contemporary and minimal, the diamond in the Millennium Ring can be seen from all angles, setting it apart from other designs, and making it a true South African icon. For those with a romantic disposition, our signature Two Hearts and I Do engagement rings incorporate the most charming of romance symbols: the heart. The Evolym ring (the words “my love” written in reverse), another Shimansky original, is also a beautiful choice for an engagement, as it is available in a variety of distinct designs, and can be made with or without micro set diamonds. You can choose from a selection of classic diamond shapes, or one of the signature Shimansky cuts, such as the My Girl diamond cut, which was the first international diamond cut patent to originate from South Africa. The My Girl is the first world’s first square-cut diamond with a diamond-shaped table, and this unique eight-sided square cut reflects light when viewed from any angle. A stunning option for an engagement ring, it can be incorporated into various different ring styles and settings. Another Shimansky-exclusive is the Brilliant 10 diamond cut – the most brilliant diamond in the world. When compared to a round brilliant cut diamond, it scores up to 25% more brilliance, making it a truly magnificent display of light. Only the purest precious metals are used in crafting Shimansky engagement rings including platinum, palladium and 18K white, yellow or rose gold, so that you can rest assured that your diamond and your memories of that special moment are safe and securely set in resilient metal that is both everlasting and elegant. 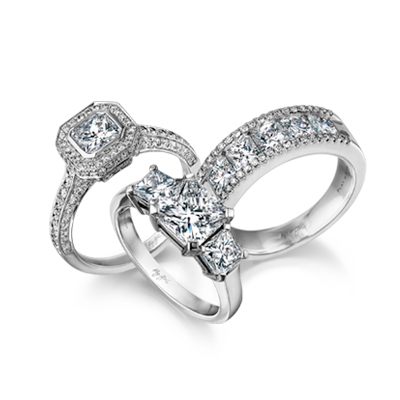 Platinum is the superior choice for many when buying diamond engagement rings because of its strength and durability. For those who are looking for engagement rings with coloured stones, the Shimansky Fancy Yellow Diamond collection offers a striking alternative to colourless diamonds. If you have a specific design in mind or interested in desiging your own bespoke engagement ring, we will create a truly unique engagement ring just for you, in a metal of your choice, and in a design that truly captures your love. Shimansky engagement ring collections are accompanied by a range of other jewellery creations, including pendants, earrings and bracelets, to help complete your look on your wedding day. Matching wedding bands for him and her are also available in the Shimansky stable of designer jewellery.